The last several weeks have been crazy at my house, so I haven’t been posting much. It feels good to finally get something published again. Today, I’m linking up with Focused on the Magic’s Wordless Wednesday Blog Hop! Traveling to Disney World/land is always a cause of celebration, but here are a few pictures of mine that this week’s theme made me think of. Closing down the Magic Kingdom on my Birthday! Birthday Breakfast at the Resort: Pop Century’s Tie Dye Cheesecake! What are your favorite Disney Celebration moments? Thanks so much, Deb, from Focused on the Magic for hosting Wordless Wednesday each week! Check out the other posts on my site while you’re here, follow me on Pinterest, Twitter, like me on facebook, and/or subscribe to my blog. (You’ll enjoy Daily Doses of Disney on my facebook page!) 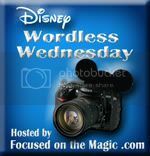 Then, don’t forget to click on the Wordless Wednesday icon to check out more Disney blogs and their Celebration posts! Some amazing memories made, lovely pictures. Thank you! Definitely great memories for us!